One of the first illustrations of the Great Boston Fire of 1872. Boston - General View of th Ruins, From the West Side of Washington Street - The Old South Chuyrch and the 'Transcript' Building in th Foreground. 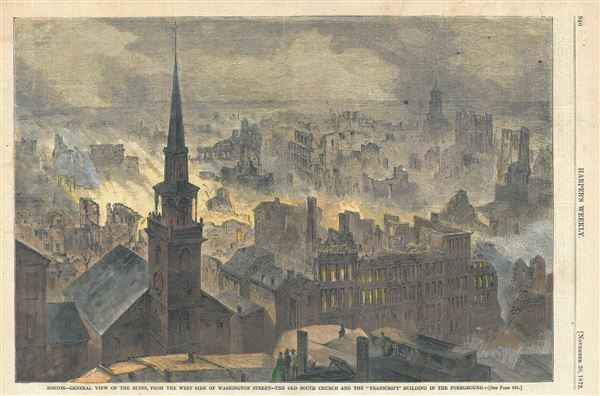 A dramatic journalistic view of Boston, Massachusetts prepared to illustrate the Great Boston Fire of 1872. Issued just three weeks after the tragic fire (November 7-8, 1872), this is one of the first publications to illustrate the fire's fury. Very good. Even overall toning. Backed with archival tissue.